Traditional way of getting a loan, that involves going to a bank and filling an application is probably the only way most people imagine. However, there are a lot of other ways to get funds for your small or medium-term business. 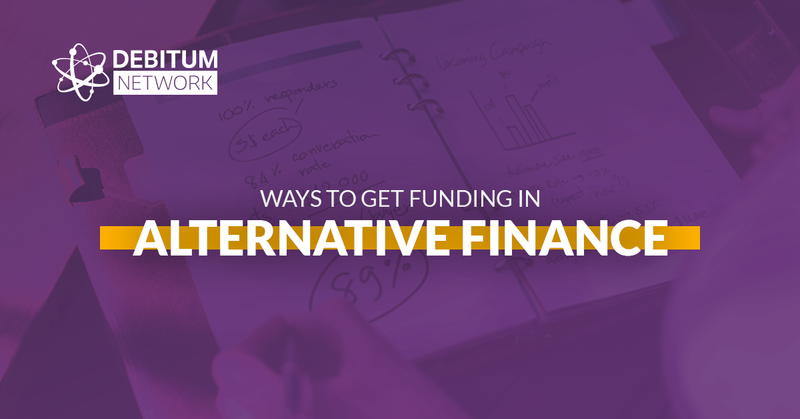 Alternative finance p2p platforms such as our own Debitum Network or Mintos, Zopa, Funding Circle, Assetz Capital and others can offer you a few possibilities to choose from. This blog post aims at describing some of the most popular ways that alternative lenders provide funds to small businesses. Equity crowdfunding is the process when, typically, a lot of people (crowd) provide money to small business in return for equity. Small businesses do it with the help of a crowdlending platform. This type of funding has been around for many years. However, in the past it would take big businesses or angel investors to provide the bulk amount of funds. In traditional IPOs, the starting sum would be $ 1 million. Nowadays, a lot of people with as little as $ 100 can participate in the funding process. Peer to peer lending is online lending service that connects individual investors with borrowers and a loan is provided with an agreed fixed interest rate and maturity. Borrowers have their profiles on P2P lending platforms and investors may look at them, analyze past performance and determine whether they want to take risks lending money to that specific borrower. Borrowers can be both individuals and small businesses. An individual may provide a partial or full amount requested by a borrower. The rest money will come from other individual investors. To some extent, Debitum Network can be regarded as P2P lending platform, despite the fact that it only lends money to small and medium sized businesses, not individuals. In this regard, it is B2B (business to business) platform. Property finance type of funding is usually a secured business loan, where property (residential, business or property portfolio) is used as a collateral. You use the option when you want to borrow to buy property for a business or redevelop your existing property. You may also need to have a big deposit (up to 40 percent) for getting this type of loan. The benefit of that is that the bigger the deposit, the smaller the interest rates. In invoice financing a borrower uses his customers’ outstanding invoices to borrow money. A lender buys those invoices. In this way, an invoice of sales becomes a security for a loan. It has an advantage that you do not risk losing equity of your company. Small business companies often use this method of funding to get cash without waiting for the payment dates from their customers. The payment terms can be a drag as businesses often need cash fast for operational expense. Invoice financing allows you to transfer payment terms to your lender and you get the necessary money immediately. Invoice financing average return averages around 10-15% per year. Asset based lending is any kind of lending secured by an asset. When an asset is used as collateral, in case a borrower fails to repay the loan, the lender takes the asset from the borrower. This type of lending is typically used when a lender is not convinced that a company can pay the loan through its cash flows. Typically, the assets that are taken as collateral are: inventory, accounts receivable, machinery and equipment. As you may see, there are plenty of ways to get funds for SMEs outside of traditional banking system. When Debitum Network platform launches in September, 2018 small businesses will have lots ways to get funding. There will be assets such as Factoring, Business loan, and a few more to choose from. Average expected returns for investors would be 7-11% per year and short term loans will vary from 2 weeks to 6 months. As platform is going to be global, any investor from around the World can invest in any asset with a flexible amount of capital, not necessarily full requested sum.